During journey with GoAir, I lost my PAN card in flight which I realized after coming home. It was grateful of Mr. PRASHANT BHAGAT and Mr. GOPAL INGLE that they took care of my PAN card and immediately called me up to take it back. I would like to thank you both of them for such courteous act and appreciate GoAir services. Looking forward my journey with GoAir in future. This is in reference the the excellent support and guidance provided by one of your team member (Rahul Mourya) from Bombay Airport Mumbai. I, Jignesh Worah, Grandson of Mr. Tokarshi Worah (Age 93 Yrs) dropped him today at Mumbai Domestic Airport for a GoAir Flight to Bangalore G8 382 well before time. However, My Grandfather was not able to board the flight even after check in due to some confusion. We got a call from your staff, Mr Rahul stating that the passenger has not boarded the flight. On our request and on coming to know that my grandfather is of 93 years old, Mr Rahul made all his efforts to trace him. Although my grandfather was not able to catch his flight,  however he assured that he did not face any problem to come out of the airport and get in contact with me who was waiting outside the airport on coming to know about this incident. Also I would like to thank the 2 front end male staff at your GoAir counter at gate no. 1 (who's name I don't recollect), who guided me and also reschedule my grandfather's ticket in your evening flight to Bangalore without any cost. The kindness of Mr. Rahul does not limit to the time the passenger left the airport, but he showed his support and guidance even during the evening flight by proactively calling me to confirm that we are reaching the airport on time and making sure that my grandfather is not facing any difficult in boarding the flight by arranging for a helper who would take my grandfather till the flight and to add a cherry to the cake, he even called me to confirm that my grandfather has entered the plane and I should not worry. I am very impressed and happy with the wonderful and excellent Customer Service gratitude of Mr Rahul and would once again like to thank him for his support. The propose of writing this letter is to convey my sincere to your employee and GoAir organization. Before yesterday I freaked out of an incident I had when I did not receive my luggage with all the valuable gifts and items in it, that was on 25th August midnight, and I had another connecting flight in the next hour from Nagpur  to Qatar on 26th August. I didn’t know at that moment what could I alone do, should I continue my trip and forget my luggage or I should stay alone in Nagpur airport without anything and miss my flight while my family are panicking and waiting for me at home. I was extremely fortunate to have Mr. Nilay Janbanddhu Goair at that moment, where he guided me to my next flight counter (Qatarairways) and non-stop was making calls to everywhere looking for assistance trying to help me with my matter. I would like to take this opportunity to thank GoAir and Mr. Nilay most sincerely for all the help you gave me, specially appreciate all the time Mr. Nilay taken from his work and his rest time following up till the next day to ensure that I have received my luggage. Looking forward to be onboard with you again, and wishing you all the best and success. I want to inform that i want to appreciate Sonia from Pune who helped me at a very desperate time. I was traveling with Indigo and at the counter I realised I had lost my debit cart. I asked at the counter if I can Paytm them and they bluntly refused. So I approached Sonia from Go air who went out of her way to help me. She didn't have Paytm but she still have me 500rs and said it doesn't matter I can take it. However I refused and took another colleagues number and transferred through Paytm. Her act of kindness helped me from loosing my flight. I would really like her act of kindness to be noticed. We were traveling to New Delhi and Agra from Hyderabad in our Indian trip. I am glad we chose go air. Go Air representative Mohammad Ibrahim at the check in counter and gate was super helpful in explaining out options, help with our luggage, wish us the best for the trip. Thank you Go Air for the wonderful staff. Please appreciate him on our behalf and thank him for his wonderful service. Much appreciate his help. I am a regular flier of go air as I travel to Hyderabad twice in a month. It's been quite some months I have been seeing Mohd. Muzzamil at the desk everytime I travel. I must say that he is a very humble, dedicated and sincere person in his duties. I really appreciate his hard work and commitment for the airline. I wanted to give this feedback long time back but somehow could not give. And this trip I made sure I give feedback for him as he deserve this very much. I was travelling from New Delhi to Bengaluru by Indigo flight 6E 2273 at 22.10 hrs. on 04 May 2018. At that time GoAir flights were also taking off. Unfortunately, my hand bag was picked by GoAir passenger and left. I am glad to inform you that without my efforts, my hand bag was traced out at Kolkata Airport by Mr. Partha Sarathi Jena, Security Supervisor of GoAir who immediately informed me the same. On confirming that the bag belongs to me, swiftly he had organized for transfer of my bag to Bangalore Airport and I received the same in intact condition. The things were kept as it is in the bag. I would like to appreciate the dedication, care and interest taken by Mr. Partha in transferring my bag back to me. Thanks a lot to GoAir Airlines for its dedicated customer support. I will give preference to fly by GoAir in future and also recommend to colleagues, friends and family members. Tons of thanks to Partha and GoAir. I forgot my wallet on my seat when travelling to Mumbai on Go air Flight number G8530. I want to thank Mr. Naveen Singh who called me as soon as he found my wallet and returned it to me. It had lots of cash apart from my documents and cards. I really urge you guys to take notice of this exemplary behavior and publish this story. It is cases like these which restore my faith in truth and humanity. Yesterday , I got my spectacle from GO Air Counter at Pune. I must say , there was a very good follow up from your side after my mail to this id. Your people has gone extra mile to ensure the Customer Satisfaction. I must mention Mr. Prateek from GO Air  (  Pune Airport ) who called me , took details & got back to me. After my initial mail , There was no further follow up from my side. All the follow up was made by Mr. Prateek & he made the things possible . Looking forward to fly once again with you  very soon. My name is Aniruddha De from Delhi. I am a research analyst and was traveling from Kolkata to Delhi on 8th March. I was quite exhausted since I was traveling from past few weeks constantly, and the queue was too long, all of a sudden a well-dressed gentleman came -Executive Arman Khan was so helpful and well behaviour, I loved his warm welcome, I must say that I am impressed with the level of customer service attitude he has shown, I was so exhausted that I was no able to stand properly in that long queue, just wanted to thank him, great customer service, keep it up. I am writing to you with delight and let you know how impressed I was with the inflight staff and their mannerism especially Preet Kaur. Thorough commitment towards the passengers wellbeing and comfort. This is an appreciation post for Mr. Aman kohli and Mr. Sharma ( don't remember full name) who helped us out on Sunday when our return flight from Delhi to Mumbai was cancelled. We were three passengers who were returning from Delhi to Mumbai and were booked in the 9.10 pm flight ( flight number 428, pnr NYBCHA). The flight was cancelled on account of technical reasons. On talking to the ground staff, we were told to initially use the lounge after midnight and they will try to accommodate in any later flight the next day. But on further requests from us, Mr. Sharma tried to accommodate us in another flight and made arrangements for the same with indigo. Thanks to Mr. Sharma for the same. Mr. Kohli then stepped in to implement the same and we rushed from terminal to indigo terminal. However the indigo flight took off. Then the staff acted quickly and arranged for a stay in NCR immediately and accommodated us in the next Delhi Mumbai flight at 10.45 am the next day. Aman ensured that end to end we did not face any issues right till we took off the next day and ensured that our stay in Delhi was comfortable. Kudos to him for showing such exemplary customer service. We left as happy customers of goair. 1) Mr Sanjay Kumar - your Executive at Port Blair who was extremely helpful and kept me advised about the developments from time to time. 2) Mr Majid Munshi and Mr Selva of your Mumbai Airport who were equally helpful and cooperative in resolving this issue. I understand that the slight delay happened due to the beurocratic attitude of the Airport Authority of India and not your offices. I wish Go Air all the success for the future. During security check in for boarding my flight G8-128 to delhi,I left my new Mobile Set in tray at Kolkata airport on 6 December.Because of promt action  and effort of Go air staff(particulary by Mr. Vipas of Goair, Kolkata)  my set got delivered to Delhi Air Port,T2 on 7 December 2017 and I have collected the same on next day morning. Thanks to all Goair staff wo rendered helped in this matter. I write to commend your staff on an exceptional level of service when my husband Mr. Gautam Sinha traveled with your airline on the 24th  Nov 2017. Gautam uses a manual wheelchair for mobility and needs assistance with transfers. Sincerely, wish to thank Mr. Prince Matthew (Ground staff support) for his  kindness, perseverance and great effort to help him. I trust that you will pass on this recognition to the specific staff members. I am a frequent traveler but my flight to Mumbai from New Delhi with Goair on 17th Nov.’17 is now the most memorable one. Happiness has no boundaries when one of the senior crew members walks upto you and very softly utters …. Ma’am you were my Principal when I was in sixth std. And there I met Kanika Gandhi wearing the sweetest smile on her face, looking at me with twinkle in her eyes. Thank you Kanika Gandhi for giving me these moments on Goair flight. It was sheer pleasure to see Kanika Gandhi enjoying her work, playing her role to perfection and looking so gorgeous. I am overflowing with pride that I take in her success even when her success is all because of her hard work, determination and sincerity. Teaching profession is one of the most rewarding one. No salary, emoluments, perks can give me the treasure that I got on this flight in the success of my student. I was traveling on a Go Air flight G8 247 for the first time from BBI to BOM on 19th Oct '17 which happened to be Diwali. Firstly to be working and being away from family on such occasions is in itself commendable and to do it with a genuine smile and warmth is excellent. Your staff on board the above mentioned flight headed by Ms. Tiniya and supported by Ms. Pinky, Ms. Sonia and Mr. Zaid were brilliant with their job. They not just met but exceeded my expectations for this particular flight and are an asset to the organisation. Wish them luck and blessings for future and thankyou for showing up and doing their duties on board in style. Happy flights see you on another GO airways flight again soon. Rupali Dugghad is a gem for GoAir. Kolkata to Ahmedabad flight. I'd like to share with you my positive ecperience with one of your staff Mr. Rakesh Rajan while checking in on 15th Oct at Bangalore airport on flight G8526. Mr. Rajan went out of his way to retrieve by check in bag when i approached him after forgetting to check in my swiss pen knife keychain. I am very appreciative for his actions and thank GoAir for being responsive to it's customers' needs. Yesterday I travelled withGoAir flight from Bangalore to Lucknow. Unfortunately, after reaching Lucknow I was informed that my Checked baggage had power bank so it is ceased in Bangalore airport itself. So naturally, I became worried with no whereabouts about my luggage. Fortunately, I met with one of your colleague name Mohammad Asad beg ( ID: 011079 ) at Lucknow airport. He very calmly asked my problem and assured me to help as much possible. He without delay contacted all concerned authority and did arrangement to transfer my luggage in next best combination of flights ( i.e BLR->Delhi->LKO) which was earlier planned to next day. I must appreciate his dedication , hard work and admirable work ethic. Consider this email as the small token of my appreciation for the help. Hopefully, GoAir also appreciates their employee hard work with something. Once again Thank you and wish you all *Happy and prosperous DIWALI* !!! 18:45 hrs as an unaccompanied minor. Her mother was to receive her at the HYD airport. But due to very heavy rains amid lightning and thunders, she was unable to reach the HYD airport on time to pick her up. There were waterlogging and traffic jams all through her way. Due to this, she was late by over two hours to reach the airport. In the meantime, she, full of fear and tension, got in touch with your airport lounge office and was referred to an executive Mr. Farzaan B Italia (employee ID: 010781). She explained her predicament and helplessness and requested him to take care of her daughter and keep her engaged till she reaches the airport. I am extremely pleased to inform you that the executive Mr. Farzaan demonstrated perfect professionalism by landing full helping hand in taking care of my granddaughter. She was allowed to talk to us and her mother on his mobile frequently to let her feel comfortable and safe. She was also given eatables and water for which he even did not accept money from her when she, at last, reached the airport. I join my entire family to thank your airline and Mr. Farzaan from the bottom of our hearts for extending all desired help in time of such a crisis. My name is Yashwanth Ande and i was a passenger on Go Air flight # G8-294, I am writing this letter in order to express my appreciation for the wonderful support extended to us in handling the missed baggage that was left behind by us in the rush to catch our flight on time. As it was a hand baggage it had no tag and was left at the security check-in counter. Initially we were quite worried as it had all my academic certificates inside. The endless hours spent in vain on contacting the Airport Support and Baggage handling services of Bangalore and Hyderabad. However, Mr.Rahul/Lokesh have erased our worries by handling the matter efficiently. I would like to extend our appreciation for the amazing work done by you on the missing baggage handling. However, the professionalism that Mr.Rahul Roshan & Mr. P.Lokesh Reddy has portrayed has impressed us immensely. He has been closely following up and kept us updated during the entire time till the last minute of the baggage being handed over to us. Your diligence, self motivation and focus is definitely a great source of motivation for the rest of your team members. You are definitely a great asset to Go Air and we personally thank you once again for all the effort you have put in to help us get the baggage safely back. I just wanted to let you know that Mohd. Ibrahim has demonstrated outstanding customer service. I had forgotten my Samsung Tab on the flight from Bangalore to Hyderabad. Ibrahim identified my number through my seat number on the flight, got to know my number and called me. I was outside and could not answer. Ibrahim then located my email Id and sent me an email informing me that he found my lost item. When I went to Airport as well, he was very courteous and showed utmost professionalism. Overall, Mohd. Ibrahim has exceeded my expectations of customer service. Myself Vipin. I am very thankful to Mr. Rizwan and GO Airline team members for helping me to get back my lost purse on 24th Thursday at Pune airport. I really appreciate your effort and responsibilities. I write to express my heartfelt gratitude to your staff for his kindest help when I traveled with your airlines on 10th August 2017 along with fragile items. helped me on fragile items and explained to how to bring going forward to avoid such things. My mom gave me that where he understood my feelings attached with that. Consequently, he managed to get my luggage, which made me feel relaxed and I believed he went extra mile for his client. I am very grateful to his help. I have been travelling in many times however I must say that I have never experienced such friendliness and kind concern as was shown to me in this situation – like to just a human being. I trust that you will pass on this recognition to the specific staff members from this flight. They are a true reflection of the high levels of standard that we have come to expect of your Airlines. Again thank you so much for your help. I greatly appreciate the assistance you have provided me. I am glad to inform you that I got call from Ms. Mandeep Kaur from GoAir Pune airport office.She informed me that the iPad I left in seat pocket has been found and kept it in office. I personally went to GoAir Pune airport office and collected my iPad from Mr. Ayush Chourasia. I am grateful to Goair and especially Ms. Mandeep Kaur for extending excellent help. She deserve big compliment and applause for this type of great care of customer. Please convey my big thanks to her. I also thank you Mr. Ayush Chourasia from GoAir Pune airport office as he took out time to complete all formalities to return my iPad during his busy schedule in peak hours. Last but not least, I am grateful to Goair for their services. I frequently fly by GoAir and today I can proudly say that my decision to choose GoAir is right and I keep travelling by GoAir. I traveled by Go Air Flt no G8 715 seat no 4E,ON 12th April from Delhi to Leh. Right from check in till dispersal the services were good and entire staff was courteous. We enjoyed the flight. While getting down at Leh, I left my mobile phone in the aircraft. Next day I met Mr Tariq Wani, the Airport Manager. He too was very courteous and after due verification, returned the phone. I thank you all for this. Now onwards, me or my friends will always fly with Go Air. Thanks a lot for your help after the initial miss from your colleague. I think only you could have helped me with the cash back, so didn't have to keep bothering! I would check with the travel agent about the refund. Great mail before the long happy weekend! Appreciate your patience and understanding! I saw Vaibhav Mathur leading the cabin crew on my flight to Delhi from Pune on 9 Feb 2014. He was confident, competent, clear and unhurried in everything that he did from serving to announcing. The general tendency is to hurry through the announcements leaving passengers gasping for their breath. He was excellent, especially when he complimented the Captain for a feathertouch landing. My name is Sunil Katyal. 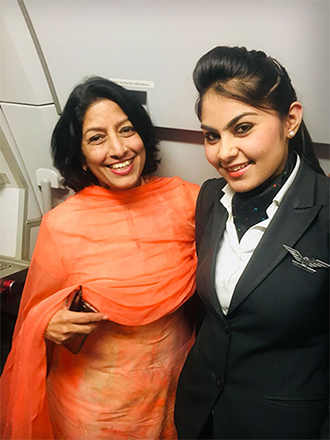 I traveled earlier tonight on flight G8 643 and had a wonderful experience and was delighted to see the effeciency of the crew specially two young ladies ms Madhuri and ms shama. I noticed that the two were constantly on their toes and were looking after the guests like they were everything for them. Even when I noticed that a couple of guests who were giving them a hard time , still these girls kept calm and did their duties. I would through this letter like to thank the entire crew on the flight on the 6th of march and particularly ms Madhuri and ms shama. Wishing you and your airline best of luck.